Construction and Schedule Management Services provides CPM Schedule Development and Project Schedule Management. Construction and Schedule Management Services, (CSMS) provides project teams with the planning and scheduling support they need. I help them logically plan their work. I develop their project schedule in Primavera P6 or MS Project. I provide progress updates and revisions, and I ultimately help them manage their projects more efficiently. Many projects suffer from multiple schedule issues. Many projects do not finish on time or they require the addition of resources towards the end of the project in an attempt to recover schedule slippage. Do your projects suffer from any of these common symptoms? Does your project team have trouble successfully managing the project schedule? Does your project team complain that the schedule “no longer reflects their plan to finish the project”? Do your projects tend to finish late, despite the addition of extra resources to finish the work? Are you not able to accurately predict your resource needs and finish dates? Do you lack confidence in what your project team reports for progress to-date and project completion? Is your project team unable to provide acceptable supporting documentation for change order time extensions or delays; resulting in eroded customer trust through unsubstantiated negotiations? Or do you absorb the cost of acceleration or extended overhead and liquidated damages because your schedule was not developed and managed properly to provide you with a valid basis for negotiating time? This does not have to be the case. I can help you. Almost all Project Managers can develop a basic schedule. But because scheduling is a specialty, they almost never have the training or experience to follow AACEi and industry recognized Best Practices. They should not really be expected to understand what the calendars, relationships, coding and resource loading do “behind the scenes” in the scheduling software. 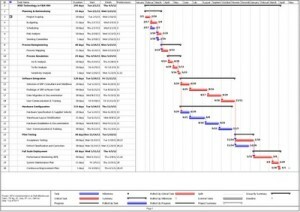 Producing a pretty Gantt Chart, based on a list of activities with desired milestone completion dates, is simple. This happens all too often and does not provide a valid project schedule. Creating a true precedence diagram “Critical Path Method, (CPM)” schedule that reflects an execution plan based on resource planning, activity durations, and logical activity relationships requires a planning and schedule professional. Without a CPM schedule based on AACEi and industry best practices, you really can’t accurately manage your work or substantiate requests for additional time due to the addition of work or delays. Unfortunately, there are many simple errors and mistakes made due to a lack of expertise in planning and schedule development. I can help avoid these. The most common problem is poorly developed work breakdown structures, (WBS), resulting in poor Gantt Charts, an inability to verify the entire scope of work is reflected in the schedule, and the lack of detail necessary to create reasonable logical relationships. Another common schedule issue is the excessive use of constraints. This impacts the schedule calculations for determining the “critical path” (longest path) and float values. Unless there is a justifiable reason (external event not in your control) for a constraint, logic should be used to determine the start or finish of an activity. Many schedules have incomplete logic. This is a common problem and discredits the entire schedule. Excessive use of start-to-start, (SS) relationships. This is usually due to incomplete WBS decomposition which does not allow the use of relationships to drive work in a logical, reasonable way. Excessive use of relationship lags. These do not allow an accurate schedule presentation and are usually due to incomplete work decomposition. I even see a lot of negative lags, which is not a recommended or best practice. Schedules without specific calendars assigned to activities or resources. This limits your ability to accurately model the activity scheduling or control the resource scheduling. Incorrectly assigned resources or cost. No logical activity code assignments. This limits your ability to filter, sort and analyze the schedule. Do yourself and your project team a favor, talk to me about what we can do to help you better manage your projects. Construction and Schedule Management Services. Helping YOU Succeed!